If you struggle to navigate the subway in your own city, we imagine you’d fare no better with this sprawling mega-system. 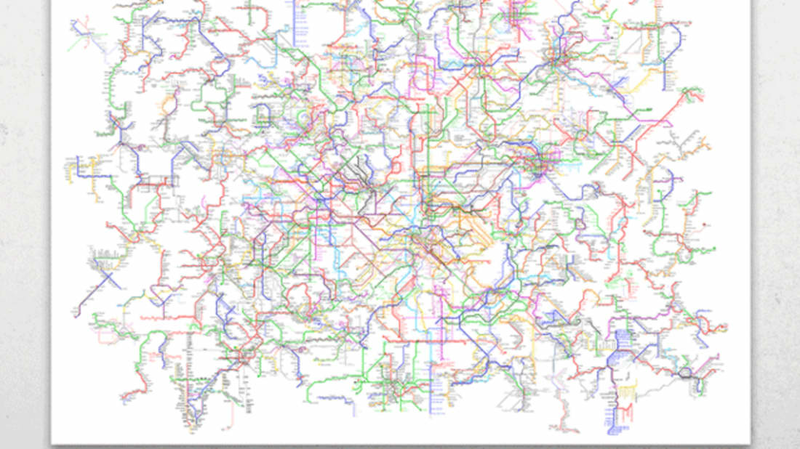 The “World Metro Map” combines the metro layouts of 214 cities from around the world into one massive map, made up of close to 800 lines and 12,000 stations. The collaboration between non-profit Open Accessibility and collective ArtCodeData drew inspiration from a collage of maps created by the architect Constant Nieuwenhuys in 1959. His concept was titled “New Babylon,” and it envisioned a borderless system that spanned the whole planet, allowing people to travel freely. This new project plays off that idea by using existing metro lines to create a fictional transit system that connects five of the world's continents. You can use the map to plan out hypothetical routes from Manhattan to Beijing, or from Paris to Tokyo. The maps are currently available for preorder on Kickstarter, where the project met its funding goal of $6000 in just two days. You can reserve your own print for a pledge of $29 or more with shipping estimated for March of this year.